Here's the basics of how to view and sort through your photos. You'll be able to view your photo gallery, compare images, mark your favourites, view them with a few filters, and share them on Facebook or Twitter. Your first step should always be to Log In to our website. This allows you to view your private gallery and also lets you save favourites and shopping selections between visits. Returning Users: If you booked your photo appointment through our online calendar, then you already have an account. Just click Log In at the top left of your screen and enter your email and password. Once you've signed in, a link to your photos will automatically appear on our home page. New Users: If for any reason you don't have an account, choose Create Account and enter the requested information. To view photos, you will also need to enter a Gallery Password in the Find My Photos box on our home page; this was either emailed to the person in the photos or perhaps distributed at an event you attended. What if I don't have a password? If you don't have an account to Log In to, and the gallery password hasn't arrived in your email, please Contact Us. We will send you a copy of the email, or find another way to get you the information. 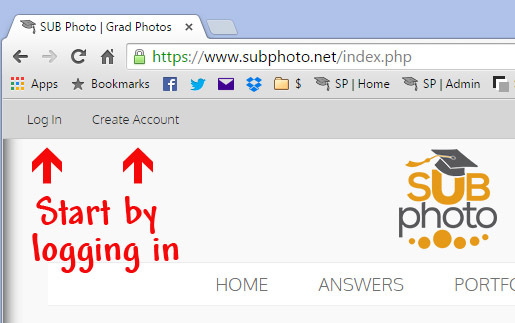 It is worth checking your "Spam" or "Junk" folder in your email as occasionally our messages are filtered; our messages are sent from either "studio@subphoto.net" or "subphoto@ualberta.ca". If you add us to your contact list that will help your messages arrive to your inbox. Can I show my mom? Photos are meant to be shared, in our opinion! On the wall of your Facebook page, or (even better) on the wall of your home. (And don't forget, on the wall of your grandma's home too!) There are a few handy tools that can help you pick favourite images and share them with others. Note: your favourites and shopping cart will only be visible on your current device unless you Log in. By logging in, your actions will be saved to your account so you can continue on another computer or device when you sign in there. Buy Photo: This icon appears above, below, or to the side of your image depending on your view. Clicking this will bring up the shopping cart options (covered in another article). Favorite: Click the heart icon to mark photos as your favourite; click the "Favorites" link in the menu to filter out other photos and view only the ones you've marked. Compare (not available on mobile): Click this on several photos; when you have chosen 2 or more, the option to "Compare Photos" will become available. Clicking this will enter a full-screen view on your computer with the selected images side-by-side. Take time to think about who would like a copy of your photo. This is a big moment in your life! The people who care about you will also be grateful for a portrait of you at this point in time - grandparents, brothers and sisters, and definitely your parents will be excited to receive a nice photo of you. Don't forget something for yourself!